Who says blazers are just for the office? We are offering you a list of our 20 favorite blazers for both work and streetwear that will challenge conventional ideas about the uses of these stylish jackets and truly revolutionize your closet. From ruffles to stripes, this collection of blazers for women features a variety of the classic work wear staple in lush fabrics, fun prints, and trend-setting cuts that will elevate your style to new levels. If Barbie went to work, this would be her favorite blazer. 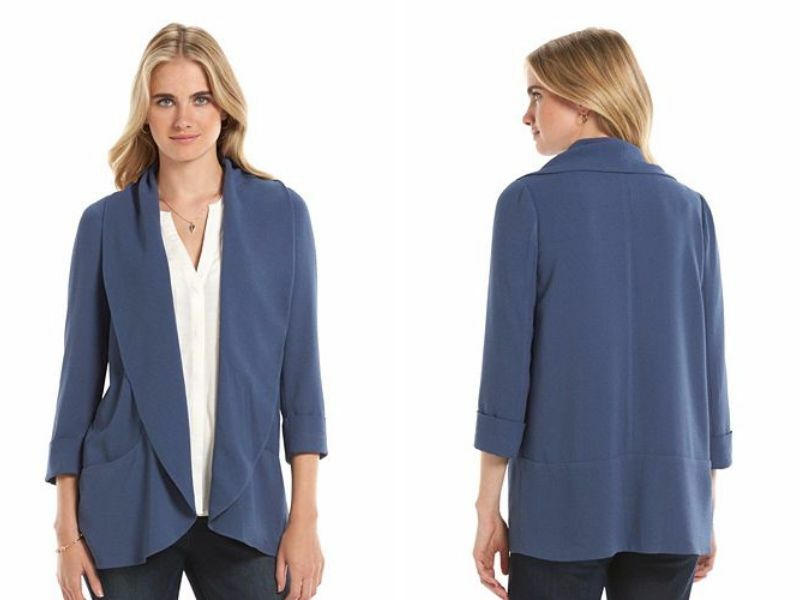 Topping the list of our favorite blazers for women is this jacket with a shawl collar and curved hem. 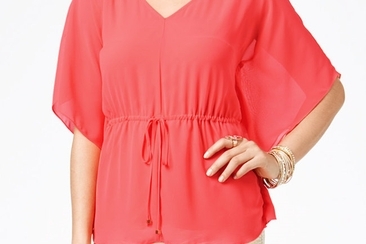 Let the vibrant pink hue shine through, and pair with a simple tee and jeans for a feminine, yet polished look. 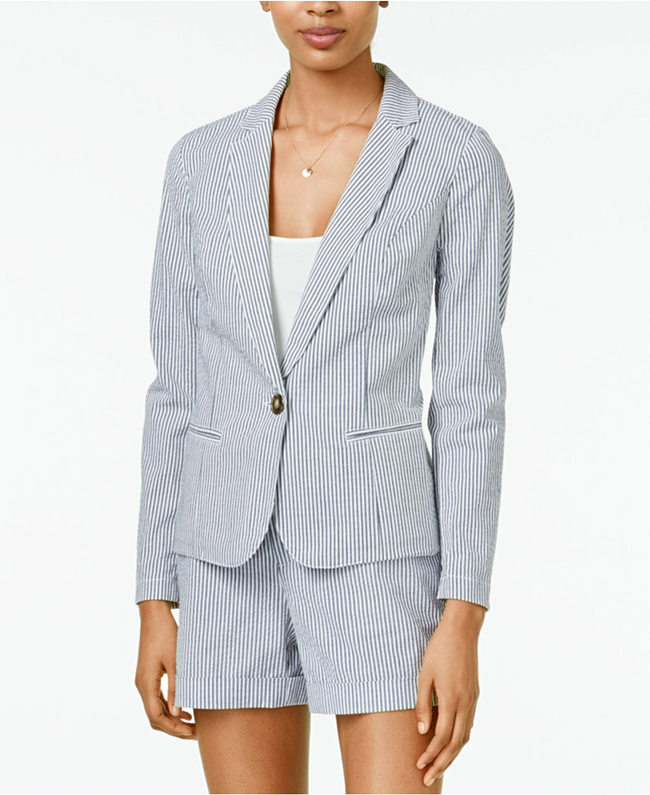 We love the ultra-flattering fit of this woven blazer. Featuring soft tweed fabric, piped lining on the edges, and a self-tie belt for a cinched waist, this blazer is the perfect neutral to accompany any outfit. We particularly love it for fall and winter, as it can double as a light coat on cooler days. Stripes are always in. Opt for this classic seersucker jacket in a timeless cut and design that will provide you with years of use. You can easily wear this to work, but it would also look darling with a pair of white shorts and tan wedges for a slightly naval springtime ensemble. This mint, structured jacket is a must-have for spring. 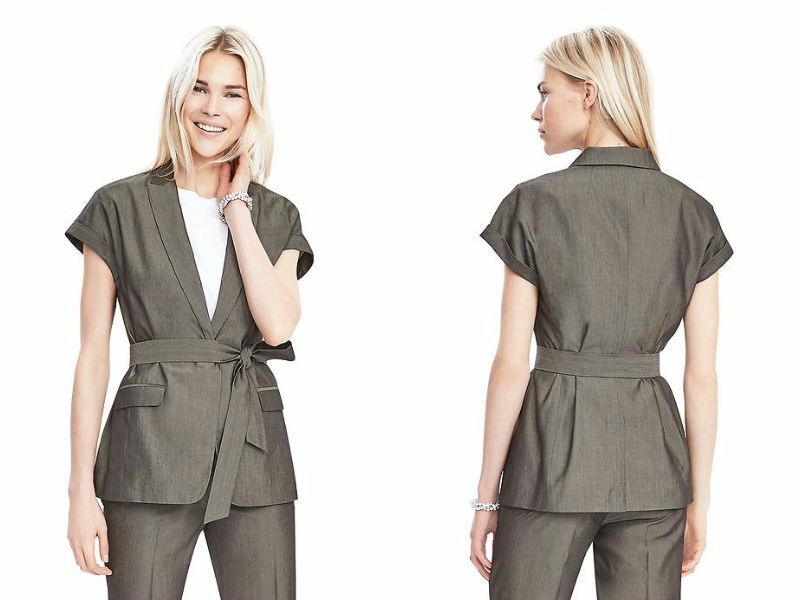 What makes this one of our favorite blazers for women is its versatility—simply pair with a flowy florally dress and sandals, and you can instantly transform this piece from all-business to casual. For a menswear twist, opt for this classic double-breasted black blazer. The long sleeves and ample buttons make this a sensible winter choice. Strut your stuff in this modern military jacket from Express. With two rows of gold buttons and embroidery detailing, this jacket will see tons of wear. Wear with a contrasting floral mini and neutral top, as pictured, for a look that is both fierce, yet feminine. The texture of this Kensie blazer is what makes it one of our top picks for blazers for women. 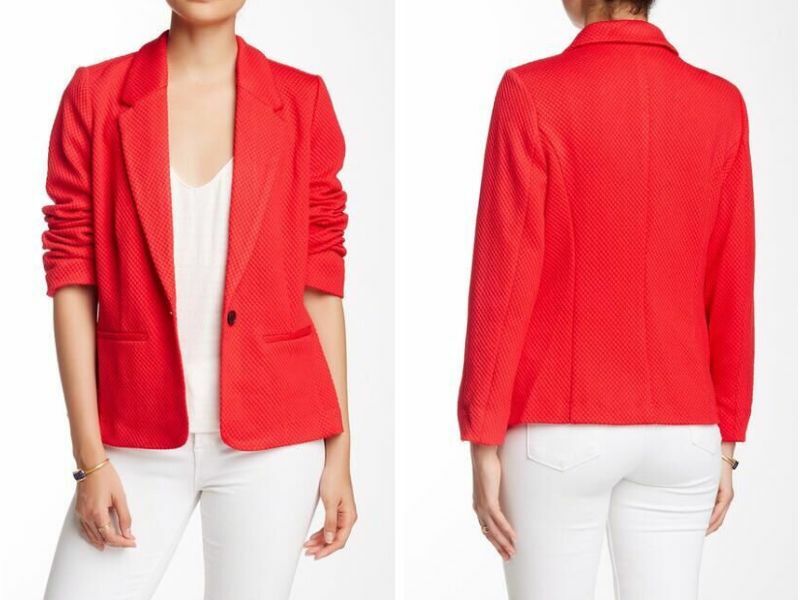 In a relatively straightforward cut, the vibrant red color and dynamic texture of this blazer make it stand-out, it can be perfectly paired with neutral colors such as white, cream, and tan. Sometimes simple is better. 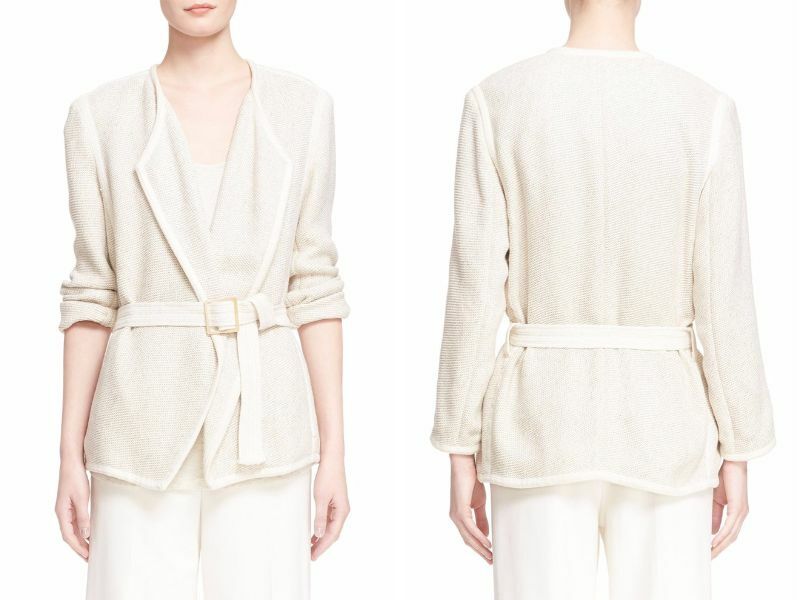 For a clean and crisp look, check out this ivory boyfriend jacket in a slightly oversized fit. This jacket can be paired with jeans and a blouse for undeniably chic and easy streetwear fashion. 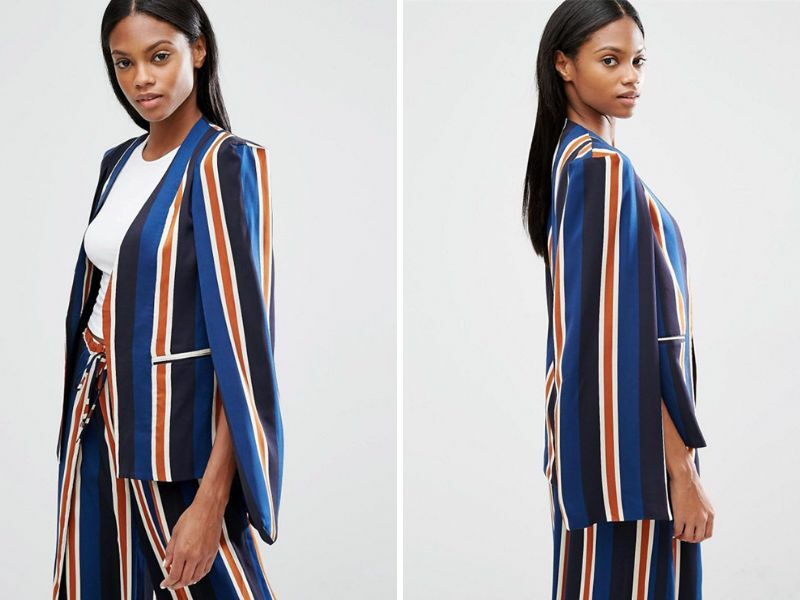 You’re sure to make a statement in this striped cape blazer from Asos. 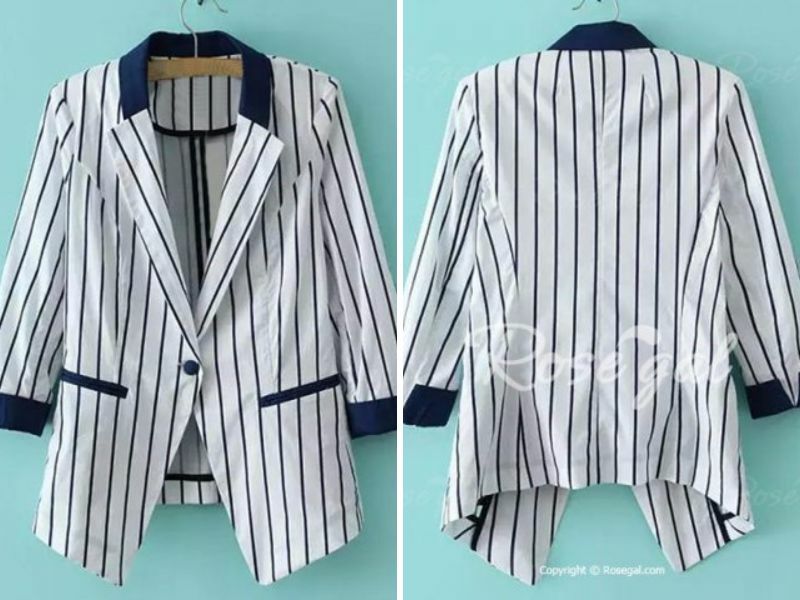 Contrasting navy, white, and orange stripes, as well as a dramatic caped cut, lend a modern fit to this versatile blazer. Pair with matching slacks for a bold office look, or wear solo with a pair of high-waisted trousers in a neutral shade, such as navy or black. 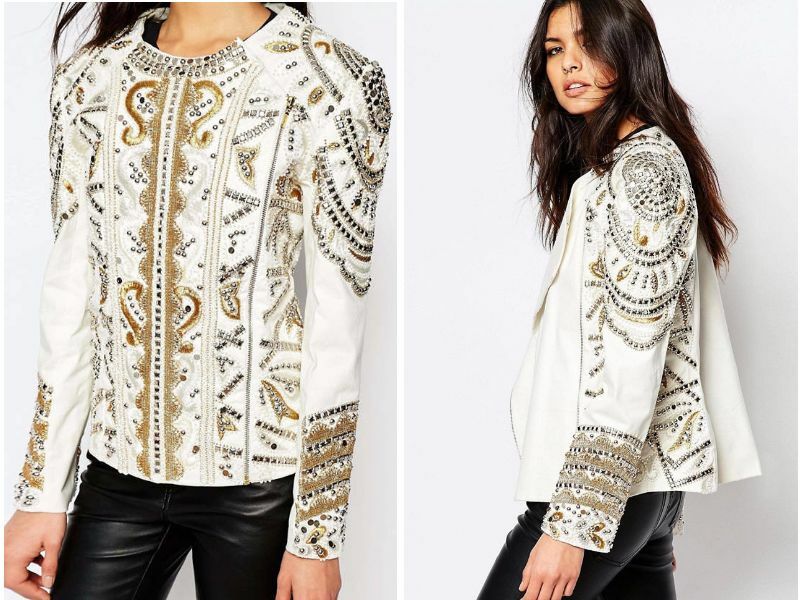 Intricate embellishments make this jacket a unique statement piece. Gold, silver, and black embellishments adorn this biker jacket for a heavy metallic look that is sure to turn heads. 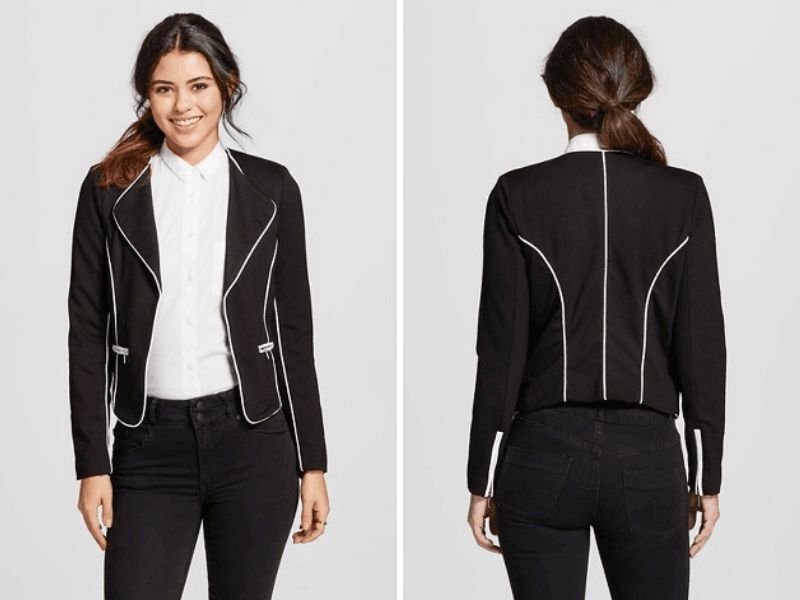 Go all-out biker, and wear this blazer with leather jeans and black booties. This neutral blazer is one of our favorite blazers for women to wear in the workplace and on the street. Scalloped lapels add an element of interest to this classic design. Perfect for warmer temps, this tuxedo vest is a modern alternative to a traditional blazer. A self-tie belt helps to define the waist and add form. Wear this with ankle pants and wedges for a chic and modern look. This cropped draped jacket is an ideal layering piece for spring and summer. In a bright aqua hue, this jacket can be worn on dresses or atop blouses and jeans. 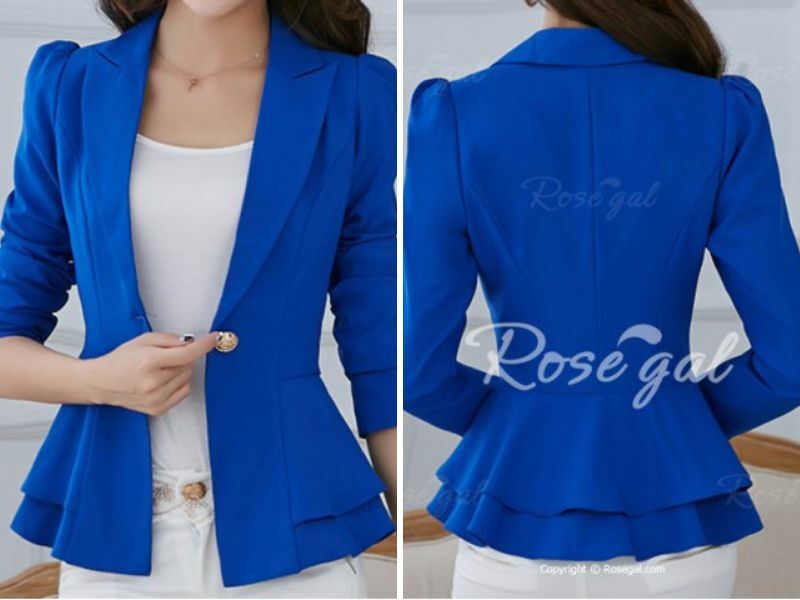 This super feminine silhouette and brilliant blue color makes this a no-brainer when it comes to blazers for women. Navy blue stripes in a tailored fit. Need I say more? The pajama look is in. 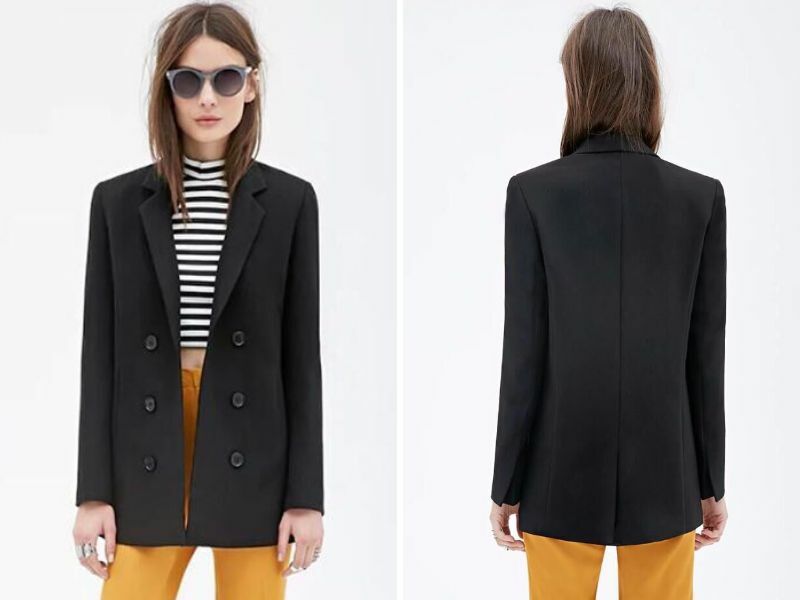 Capitalize on the trend, and snag this black blazer with white lining on the lapels, sleeves, and back. This contemporary crepe blazer with a shawl collar is a must-have for infusing work wear into your casual style. 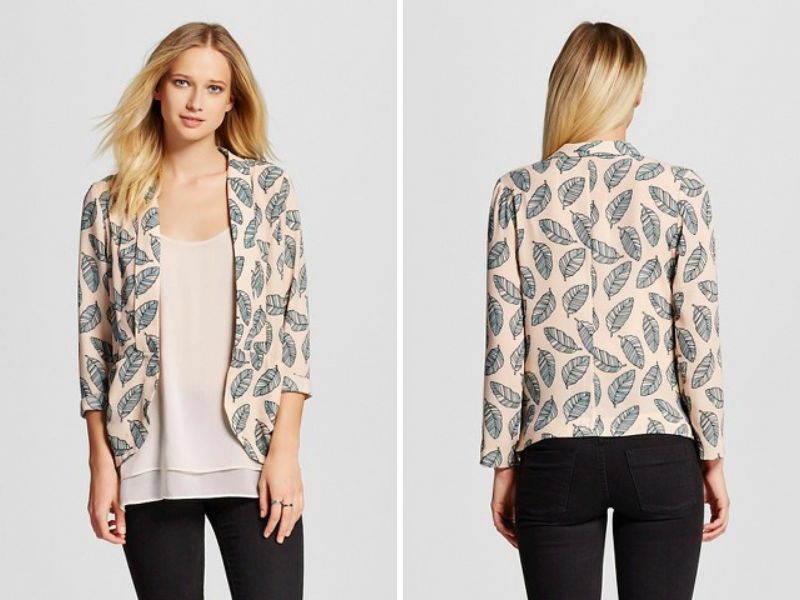 This leaf-printed design makes this blazer one of our picks of top blazers for women. Pair it with a matching peach top and ankle jeans. When all else fails, basic is better. This classic black blazer will match with your entire existing wardrobe for endless looks.